Well.. no matter how much I try I can't seem to ever get the pic right! The colors in the original painting are not as warm as they appear in the image. 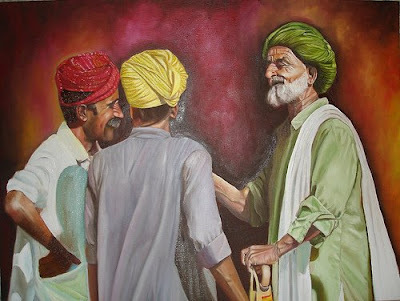 This too is a part of the commissioned series which I did some time ago but couldn't come around to post it. Ektara as the name suggests, is a single stringed instrument. The string of Ektara gives a range of tones by applying pressure at various points along the neck. This is a musical instrument that does not have markings for notes, and is played by assumption. It is the same instrument famously used by the Rathore princess, Meerabai, who's known for her devotion for Lord Krishna. I have painted this instrument before and am not sure why I was drawn to paint it again, nevertheless I enjoyed painting it. It's a part of the commissioned series I am working on. Hope the person likes it! 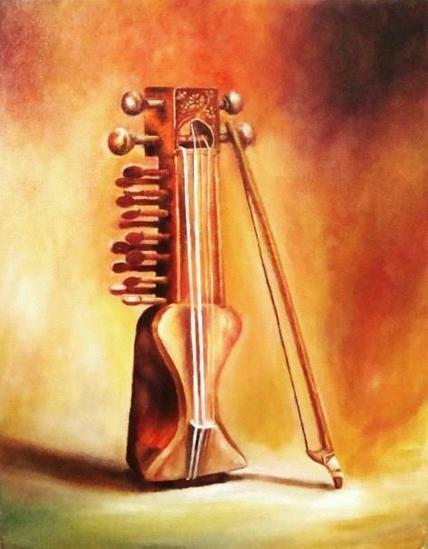 This is the second of the series of paintings I am working on and this also happens to be my second painting based on Sitar. I am not really surprised about the fact that it took me too long to get back to the subject since I had given up painting (I didn't paint for over three years ) but I can't help but notice the time of the year I last painted this instrument. It was the month of Feb! Coincidence? And I was beginning to believe there are no coincidences in life! PS: Sorry for the glare.. I took several shots of it with different settings yet couldn't get rid of it! I came across this beautiful instrument while researching on Indian musical instruments and instantly fell in love with it. It was designed, created and also played by the Fifth Sikh guru, Guru Arjan Dev. He instructed his followers to practice singing sacred shabads with this instrument to elevate the soul. It has a very deep and mysterious sound and is considered to have a healing effect. Sadly, Saranda vanished from the Sikh traditions in India around a hundred years ago, and now can mainly be found in museums and among few Sikhs who still play this instrument. I enjoy doing potraits and had been wanting to get back to it for some time now. So I was thrilled when my sis shared a picture that she came across. One look at these little devils and my hands were itching to get them on my canvas. Lewis Carroll's Alice in Wonderland might have been inspired by a moment like this I think :). For me too, it turned out as much fun as I thought.